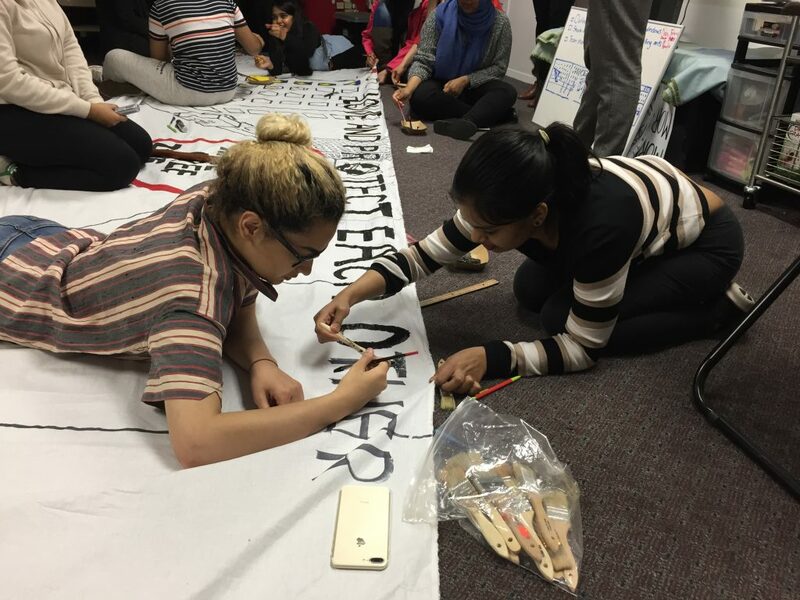 The New York City-based DRUM–South Asian Organizing Center (DRUM, formerly known as Desis Rising Up and Moving) has often been at the vanguard of political activism among South Asian community organizations. The organization was formed in 2000 as a coalition of working class and low-income South Asians of all national backgrounds to fight for causes like immigrant rights, economic justice and youth empowerment. The organization, like many other long-established activist groups, has been taking an intersectional approach to social issues well before the concept was mainstreamed in the wake of the 2016 election. For instance, DRUM’s first public action was a mobilization against police brutality in April 2000 to protest the acquittal of the NYPD officers involved in the killing of 23 year-old Amadou Diallo in 1999 in the Bronx. DRUM has been involved in launching many different projects since November 2016, including community defense initiatives like Hate Free Zones designed to protect and empower members of communities such as undocumented immigrants and Muslim women who are especially vulnerable to state repression and white supremacist violence. One of DRUM’s newest undertakings is Moving Art, a program by and for youth, working class artists in the city who want learn ways to meld art and activism in their daily lives. 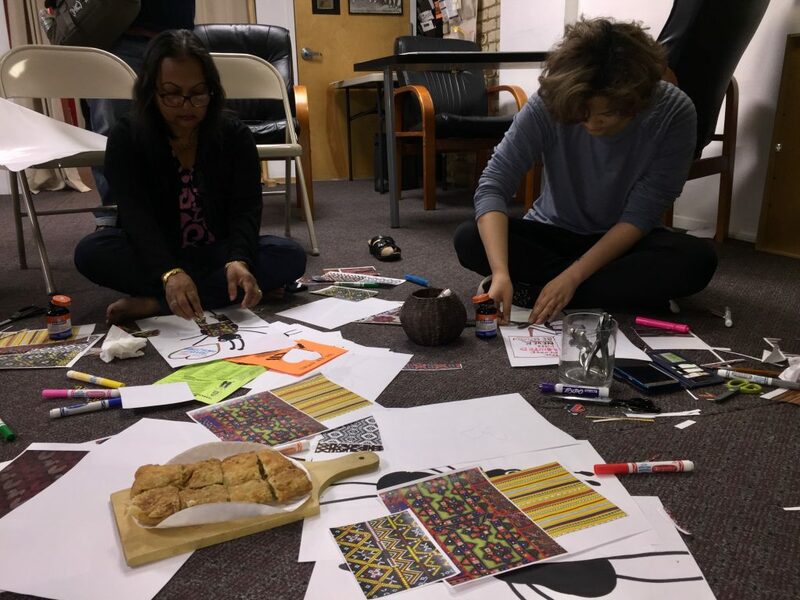 “Art with organizing is all about building people’s power and finding strength in our communities; and art has always existed in our communities, especially in South Asian culture…that’s where our power lies,” Raihan told Kajal. As an artist, she found encouragement and validation for her work particularly in progressive organizing spaces over the years, whereas more mainstream environments can often be exclusionary, especially towards women of color. She, John, and other organizers wanted to recreate that kind of nurturing atmosphere within Moving Art while also imparting to participants the hard skills needed to carry out productive community activism. “There’s so much strength and potential there that it does have the ability to create change, especially when you move outside yourself and connect with other people,” she said. They started by searching out other groups that used the arts in their organizing, a quest that led them to California. They met with activists who work in a variety of mediums, like radio and public mural-making, who worked hard to win the investment of their neighbors and community members at large, instead of presumptuously inserting themselves into existing social fabrics. In California, Raihan and the other organizers gathered ideas and best-practices to guide them while creating Moving Art’s programming. Back in New York City, the search for participants began in earnest in the early months of 2017. DRUM put out a call for applications online. Interestingly, all but one of the applicants were women. Raihan was originally surprised by this development, but noted: “When we were thinking about it, women do a lot of the cultural work. We are cultural workers and we carry that work at home and school and at work.” Ultimately, ten people were chosen out of the total applicants to be part of Moving Art. Given that all ten were women, the organizers felt it was important to focus on gender justice in the curriculum and on the impact of gender-based oppression within issues like anti-immigration policies or worker exploitation. The Moving Art artists came from a variety of different creative backgrounds, including dance, photography, painting, and writing. 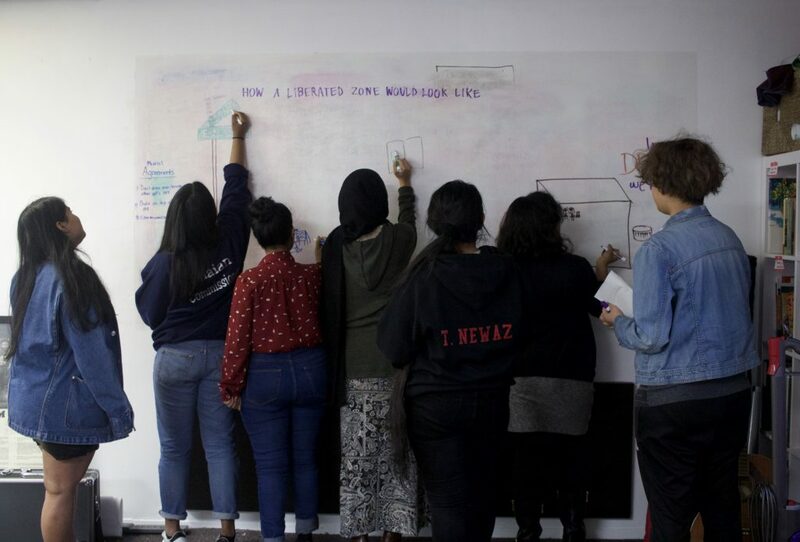 The program kicked off with a few sessions of political education and training around subjects like capitalism and hegemonic ideologies, and how the participants are situated in and affected by these social structures both as working class South Asians and as artists. The capstone project that the artists embarked upon was in partnership with the Hate Free Zone initiative. DRUM has a large member base, and cultural and artistic events or exhibits were seen as an effective way to reach out to members whose involvement has waned or who want to build stronger relationships with the organization and its other members. In that vein, the Moving Art artists are currently amassing oral recollections of DRUM members on their personal experiences fighting for immigrant and worker justice in the face of oppression over the years. These stories will become the foundation for the creative work that Moving Art will produce as a collective by the end of the program in June. “It [the project] connects to the Hate Free Zone in that it is envisioning our liberation, and art especially is a way we can envision what we want our communities to look like, or what a liberated zone in our communities looks like,” Raihan said. Ultimately, the organizers’ plan is to have a gallery exhibition of Moving Art’s output at the end of the program. Since Moving Art is a pilot initiative for DRUM, the question of sustainability looms large in the minds of its makers. Raihan hopes that the current participants will be able to carry the program forward into future years and new directions. More broadly, though, she wants Moving Art to serve as a springboard for a more innovative and involved approach toward the inclusion of art in everyday organizing at DRUM, in ways that allow all interested members to contribute their ideas.